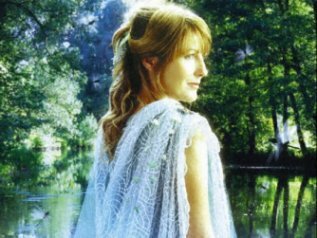 Goldberry, daughter of the River-woman of the Withywindle, was the companion of Tom Bombadil. Fair and golden-haired, she possessed Elf-like beauty, though it is uncertain of what race she is. Her origins, too, are unknown, though Tom Bombadil claimed to have found her in the river. This suggests that she may not be mortal, but rather some sort of spirit or possibly even a lower Maia, though none of these speculations have been confirmed. Totally new character for me, what book does she appear in? She is in The Fellowship of the Ring. It seems to me that Tom Bombadil and Goldberry are personifications of nature. Goldberry is particularly connected with fresh streams and rain and thus she is like such Goddess Oshun, as just one example, or any of the maiden/sweet water Goddesses found around the world just as Tom is like horned/antlered Gods found around the world.